Roller coasters may be scary. But the only way to really get hurt on one is to try to get off the ride before it stops. 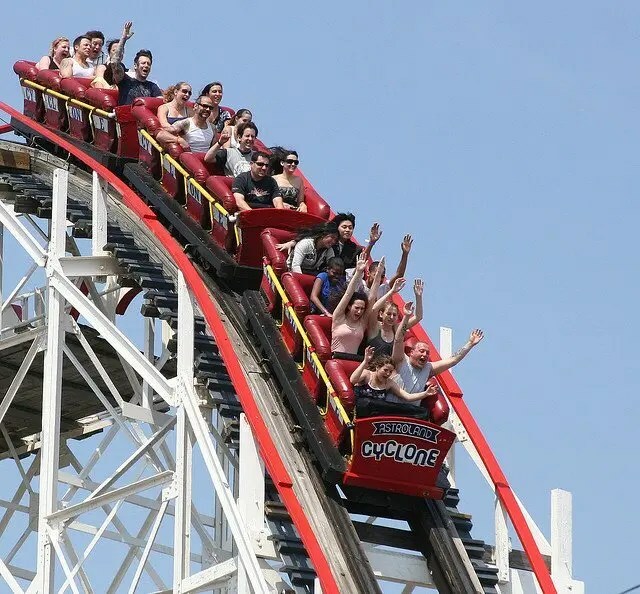 When you open up your web browser or investment account statement and see that your investments have lost value, it’s easy to get that same panicked, sinking feeling that a roller coaster can induce. It can be tempting to pull your investments out of the market to avoid the perceived danger. But that’s exactly the wrong decision to make. Getting scared and pulling your investments too soon locks you into a negative situation. The better idea is to stay in the market and ride out the storms. Because if you play it right, you can make money investing, even when you’re “losing money” on paper. No, this isn’t snake oil that I’m selling, it’s just math. Today’s nugget of Wise Investing is this: Don’t get scared and pull out too soon. Investing is a long game, and the only way to win is to play the whole way through. In our minds, we would like to think that all of the money that we invest is always gaining us more money, and much of the time, that’s true. But all investment has an inherent risk factor: It would not be possible to make money investing if it were not possible also to lose money. And although good advice and wise investing can help you maximize your returns and minimize your losses, it’s impossible to ever totally protect yourself from investing losses. That’s an important principle to understand, because it changes the way we think about investing. If I know that it’s impossible for me to totally protect myself from losses, then I don’t have to get worried when occasional losses do occur. While it never makes my day to see that my investments have lost some value, it doesn’t ruin my day either. Why? Because I understand that this is a normal part of investing, and a normal part of our world’s greater economic cycle. There will be boom times during which the whole world economy is growing, and in those times we’re all likely to see lots of gains in our investment funds. There will also be times of recession when the economy contracts; when that happens, our investments will lose some value. But that doesn’t mean that we’ve done anything wrong, and it doesn’t mean that our investment world is about to end. Back in the fall of 2008, there was a big crash in the stock market. A ton of people lost a ton of money. If you were investing at that time, you may have watched as your retirement accounts lost 15%, 25% or even more of their value. That’s certainly no fun to watch. But where some people went wrong was by immediately pulling their money out of the market when they saw that, hoping to protect themselves from further losses. Why is it a bad idea to pull out of a bad market? Three main reasons. The first is that markets are organisms of their own, and they are notoriously difficult to time. If you think you can protect yourself by pulling out at the right time, and then getting back in once things are better, you’re really just gambling with your nest egg. There’s no good way to tell with certainty where the market is going to go or when; if you get skittish and try to make the right moves at the right time over and over again, you’re more likely to get it wrong than to get it right. The second reason why it’s a bad idea to pull out early is that pulling out locks in your losses. It’s important to remember that when we invest our money, we are actually buying securities like stocks, bonds, and mutual fund shares. You don’t actually have the cash anymore — you’ve traded your cash for those securities. We use monetary figures to represent the value of those securities that we own, and those values can change a lot. But if the value of a security that you hold goes down, you haven’t actually lost any money — remember, you gave up your money when you bought that security. The only way for you to get money back from it is to sell that security to someone else. If you sell that security at a lower value that what you paid for it, that’s the moment when you lose money. In other words, the changes in the values of your securities are just gains and losses on paper — you don’t gain or lose any money in the real world until you trade those securities back for cash. Trading back for cash in a bad market locks in your cash losses. If you hadwaited for the market to recover, the value of your securities would likely also recover, and you wouldn’t have lost any real cash. The third reason why you shouldn’t pull out in a bad market is that bad markets are actually opportunities to make more money. The old adage in investing is “buy low, sell high,” and that tells us that “low” times are actual opportunities. How does that work with something like retirement investing? Say you’re using a mutual fund, and the value of the shares of that fund has gone down. You’re investing a set amount of money every month through paycheck withholding. If your investment funds were enough to buy 100 shares of the fund last month, but those shares have dropped 20% in value, your same investment money this month will buy you 125 shares this month. When the market recovers and the value of those shares comes back up, you’re going to see the value of your normal 100 shares a month recover. But if you’ve continued to invest during the bad times, you have an extra 25 shares a month that you acquired during the down time. And those shares are going to grow in value as the fund recovers, compounding the amount that you earn during the recovery. So you’re much better off to continue buying during a down market than to try to pull your money out and then re-enter when the market comes back. When you look at the lifetime return of a mutual fund that averages 10% or more a year, keep in mind that those results include both good years and bad years. In the bad years, the fund lost money. In the good years, it made a lot more than 10%. Over the course of the world’s normal economic cycles, the booms have been bigger than the busts, and plenty of investors have made great money. Most of the investment value lost in 2008 has already come back, and then some. Remember, investing is a long-term game. Rises and falls in the market will always happen, but they’re nothing to be scared of. They’re a normal part of investing, and they can actually be opportunities for you to make more money. Photo by Howard N2GOT. Used under Creative Commons License.